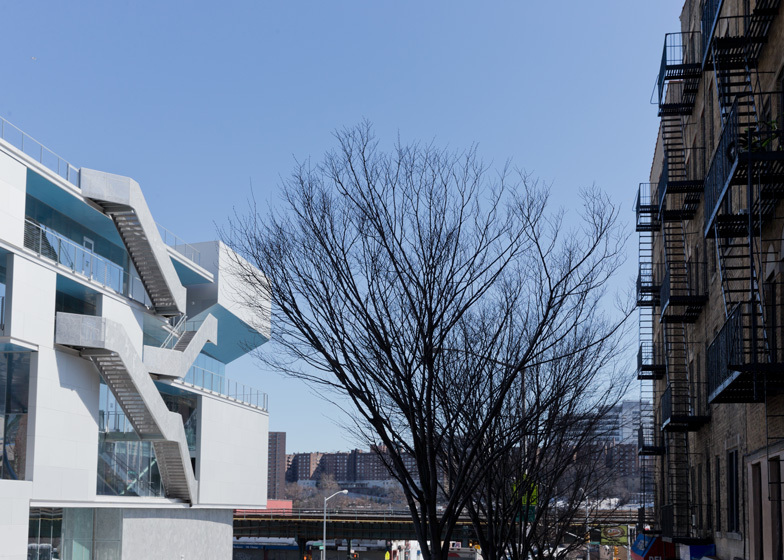 Staircases zigzag between balconies and terraces on the facade of the Campbell Sports Centre, a new athletics facility by Steven Holl Architects for Columbia University in New York (+ slideshow). 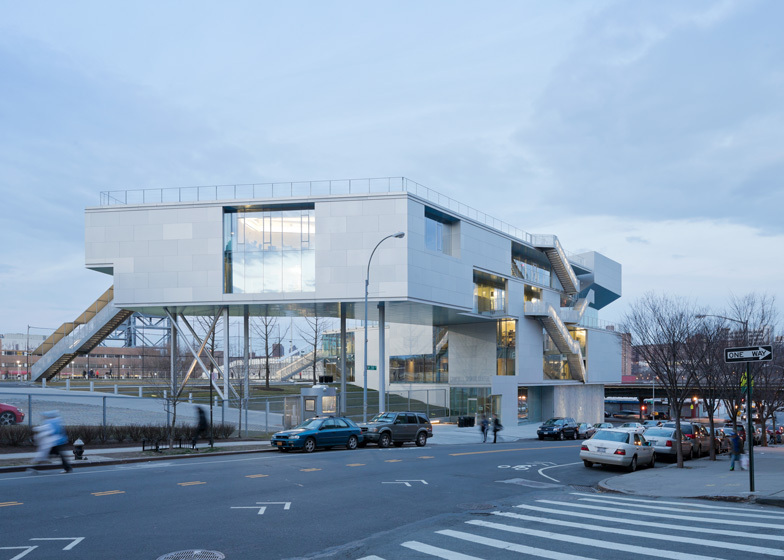 The five-storey sports centre climbs a sloping site on the corner of West 218th Street and Broadway, where it forms a new entrance to the existing sports tracks of the Baker Athletics Complex. Part of the building is raised up on stilts, while the other half staggers up to follow the steep slope of the ground, allowing the building to bridge the different levels of the road and the playing fields beyond. 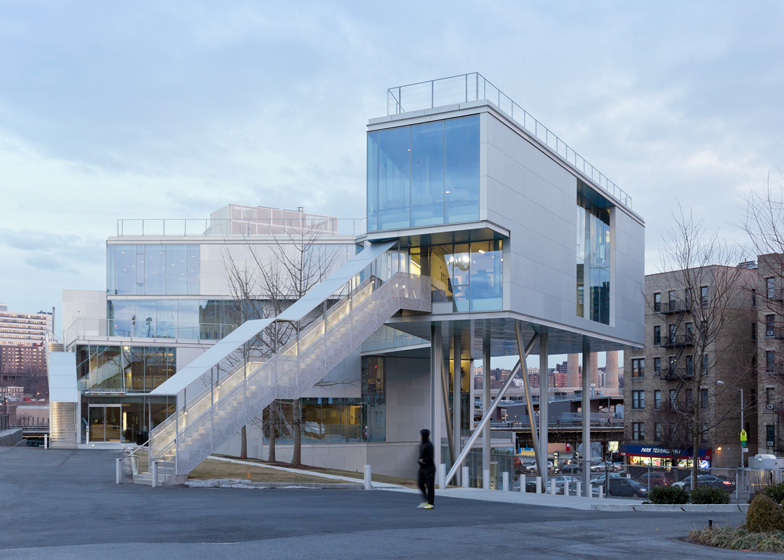 Steven Holl Architects added a series of balconies and terraces to each of the floors, which connect with the external staircases to create additional routes through the building. Two more staircases extend down to ground level elsewhere around the perimeter. The building features an exposed concrete and steel structure, and the facade is clad with aluminium that has been sanded to give it a muted surface. Different departments are housed on different floors and include gym facilities, study rooms, offices and meeting areas. Altogether the sports centre provides 4500-square-metres of extra facilities. 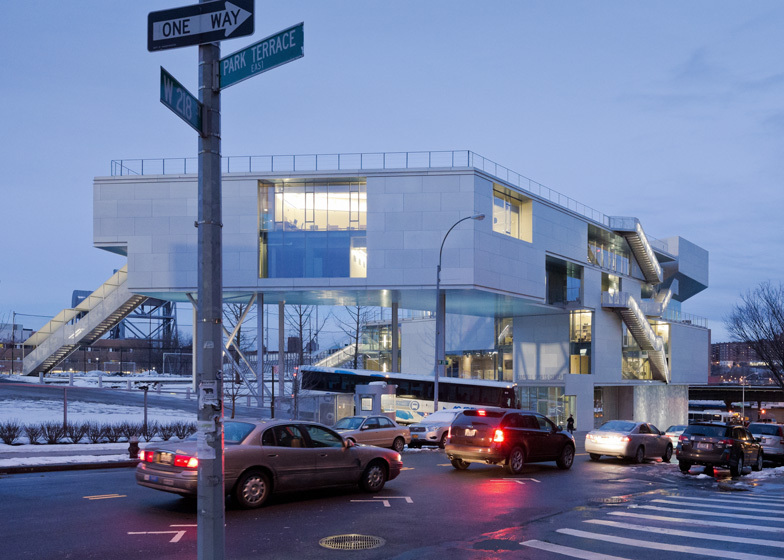 Steven Holl Architects unveiled designs for the sports centre when construction began in 2011. Other recent projects by the firm include the Sliced Porosity Block mixed-use complex and the Nanjing Sifang Art Museum, both in China. 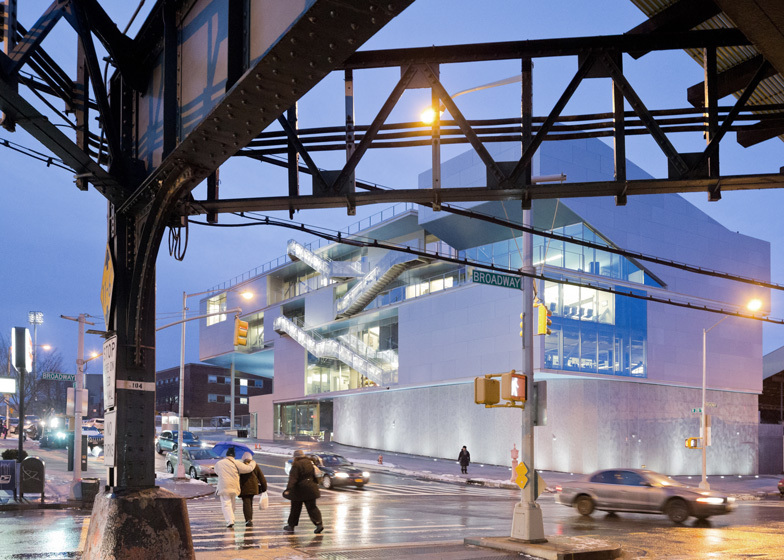 See more architecture by Steven Holl. 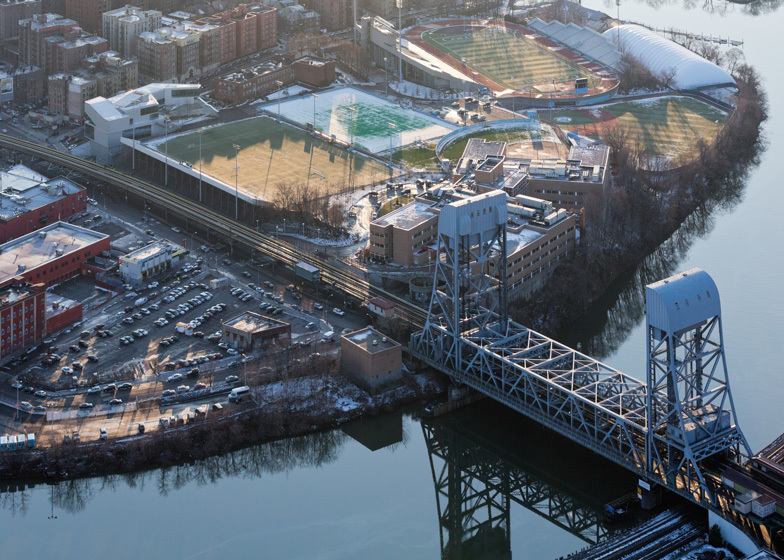 Located on the corner of West 218th Street and Broadway - the northernmost edge of Manhattan, where Broadway crosses with Tenth Avenue and the elevated tracks of the 1 subway line - the Campbell Sports Centre forms a new gateway to the Baker Athletics Complex, the primary athletics facility for the Columbia University's outdoor sports program. The first new athletics building to be constructed on Columbia University's campus since the Marcellus Hartley Dodge Physical Fitness Centre was built in the mid-1970s, the Campbell Sports Centre will be the new cornerstone of the revitalized Baker Athletics Complex and provides increased program space for the entire intercollegiate athletics program. The facility, which adds approximately 48,000 square foot of space, houses strength and conditioning spaces, offices for varsity sports, theatre-style meeting rooms, a hospitality suite and student-athlete study rooms. The Campbell Sports Centre aims at serving the mind, the body and the mind/body for aspiring scholar-athletes. The design concept "points on the ground, lines in space" — like field play diagrams used for football, soccer, and baseball — develops from point foundations on the sloping site. Just as points and lines in diagrams yield the physical push and pull on the field, the building's elevations push and pull in space. 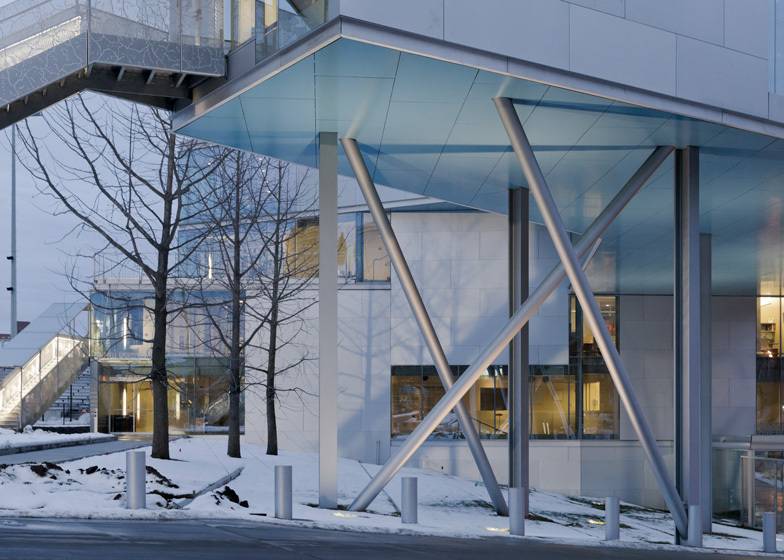 With an exposed concrete and steel structure and a sanded aluminium facade, the building connects back to Baker Field's unique history. In 1693, The Kings Bridge, which spanned the Spuyten Duyvil Creek, was the main access route into Manhattan. 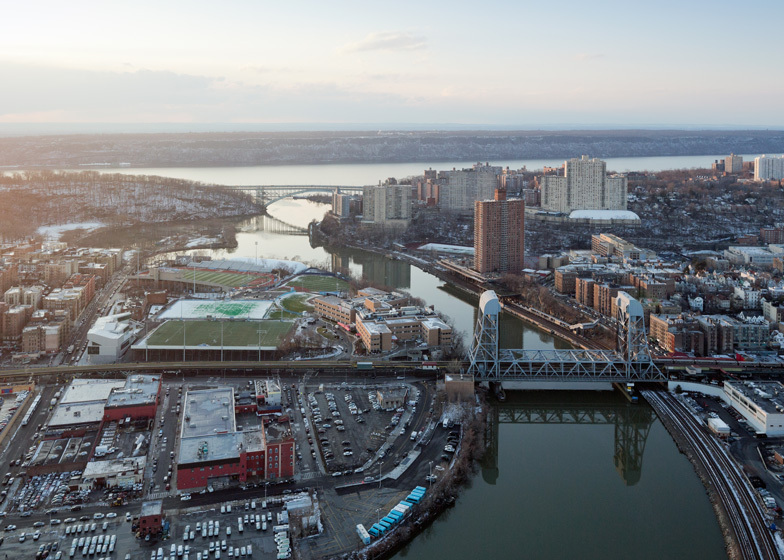 The current infrastructure of the Broadway Bridge carries the elevated subway, and Broadway, with a lift capacity of hundreds of tons. Its detail and structure are reflected in the Campbell Sports Centre.